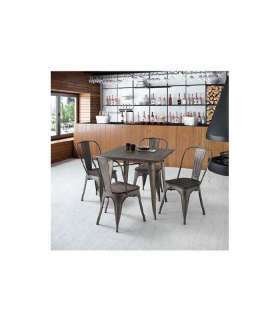 Set of table with four chairs for dining room or kitchen composed by table metal with tempered white glass top or black with grey metal frame with four upholstered metal chairs. Need to renew your living room, dining room or kitchen? with this Set of table with four chairs for dining room or kitchen. It is a set of metal table with tempered glass top in black or white with grey metal frame with four metal chairs upholstered in washable PU-trimmed black or white and scratch-resistant plastic caps. It is served in a very easy mounting Kit and with clear instructions.